A recent World Health Organisation study states that three in one hundred deaths in the UK are caused by exposure to noise. Noise is now ranked second amongst all environmental threats to public health. In response, Bereco has launched its Ambient Timber Window & Door Range to deliver a reliable noise reducing solution. The range is certified through Bluesky’s Noise Reduction Window certification. Whereas many windows and doors on the market might achieve a C, D or E rating, Bereco’s sash window achieves a Bluesky A-rated noise reduction level. 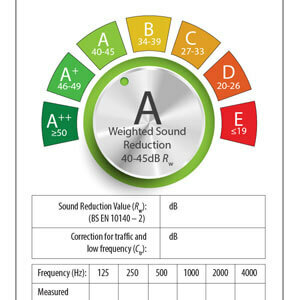 Fitting an A-rated product will greatly reduce noise levels in your building compared to a standard window.